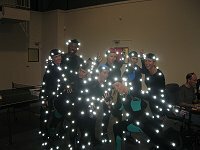 Allison Leo helped demo the mo cap system for a special event at the DreamWorks Animation Compound. Los Angeles A-Max provided 5 girls for the company to do an acrobatics and motion demonstration for SONY games. Los Angeles, CA Vicon + House of Moves hired A-Max for a 10 person demo for Image works. Santa Monica, CA Perspective Studios and Stardust Entertainment hired two A-Max stunt people for a Jamba Juice commercial. The filming took place at Perspective Studios in Santa Monica.